Delirium is a common diagnosis within the critically ill cancer population. It is characterized by acute and rapid fluctuations in mental status and consciousness. The diagnosis of delirium can be difficult and is often accomplished with the use of a validated delirium assessment tool. The prevalence of delirium varies widely with higher rates in patients who are elderly, have severe critical illness including cancer, or are known to have preexisting cognitive impairment and dementia. The pathophysiology of delirium is highly complex and may be related to changes in the brain as a result of neuroinflammation, endothelial dysfunction, aberrant cerebral perfusion patterns, and deficiency or abnormal activity of neurotransmitters. The prevention of delirium in the critically ill involves multiple components including choice of pain and sedating medications, early physical and occupational therapy, improving sleep, and daily awakening and breathing trials. There are no FDA-approved pharmacologic treatments available for delirium, though some of the antipsychotics and dexmedetomidine have shown promise in various studies. Delirium can be a challenging and deleterious diagnosis for critically ill cancer patients, but with proper recognition, as well as validated preventative and management strategies, the negative consequences associated with delirium can be decreased. Delirium is a manifestation of acute brain dysfunction that is characterized by rapid fluctuations in mental status and consciousness. It is a syndrome that spans many healthcare domains but is particularly prevalent in the aging population, the critically ill, and patients with cancer. Understanding delirium and developing strategies for prevention and treatment are of utmost importance in the intensive care unit (ICU) as delirium is associated with significant short- and long-term consequences. In the acute period, delirium is associated with prolonged duration of hospitalization, family distress, increased mortality, higher risk of discharge to a facility other than home, and increased economic burden. Persistence of delirium is also independently associated with worse short-term prognosis in patients with advanced cancer. Survivors of critical illness who experience delirium while hospitalized face long-term consequences including higher mortality in the year following discharge, long-term cognitive impairment, and persistent physical disability. Unfortunately the diagnosis of delirium is frequently missed despite being common in the critically ill and oncology populations, and it is often considered a minor and expected complication of critical illness by clinicians regardless of its independent associations with worse outcomes. This chapter discusses the diagnosis of delirium, contributing factors for developing delirium, and strategies for prevention and management of delirium in critically ill patients with an emphasis on unique factors and considerations in the setting of cancer. The term “delirium” has been generally applied to describe a variety of symptoms related to a state of altered mentation. The Diagnostic and Statistical Manual of Mental Disorders, Fifth Edition (DSM-5), provides clear criteria for formal diagnosis, defining delirium as a disturbance in attention manifested by a reduced ability to direct, focus, sustain, or shift attention with concurrent disturbances in cognition such as memory deficit, disorientation, and visuospatial or perception deficit. Symptoms develop acutely and fluctuate throughout the day and must not be accounted for by a preexisting neurocognitive disorder. Patients may display differing psychomotor behavior profiles that are further classified into one of three delirium subtypes: hyperactive, hypoactive, or mixed. Patients with hyperactive delirium often appear agitated, hypervigilant, and restless, whereas those with hypoactive delirium are lethargic with decreased movement and slowed mentation. If features of both types are present within 24 h, patients are considered to have a mixed delirium. This distinction is important as hypoactive delirium is much more common and, due to the subtlety of the symptom profile, is often missed by care providers. The gold standard for delirium diagnosis is a formal evaluation by a psychiatrist using DSM-5 criteria. Recognizing that formal evaluation is not feasible in many hospital settings, a number of validated screening instruments have been developed for bedside assessment that can be administered by various members of the clinical care team. Rapid and reliable assessment tools are important, as a large percentage of delirium in the critically ill and cancer populations will go unrecognized, in particular the hypoactive subtype, without targeted screening. This has prompted the addition of routine delirium screening for all ICU patients to current practice guidelines . To complete a delirium assessment, patients must be arousable to voice. Thus, an important first step in delirium assessment is the use of an arousal/sedation tool such as the Richmond Agitation-Sedation Scale (RASS) (Table 1) or the Sedation-Agitation Scale (SAS). While multiple validated delirium assessment tools are widely available, the Confusion Assessment Method for the Intensive Care Unit (CAM-ICU) and Intensive Care Delirium Screening Checklist (ICDSC) have been studied most frequently in the ICU, whereas the Memorial Delirium Assessment Scale (MDAS) is widely studied in cancer patients. The CAM-ICU (Table 2) was adapted from the Confusion Assessment Method (CAM) for use in critically ill patients, including those that may be nonverbal or supported by mechanical ventilation. In addition, the assessment can be administered by non-physician care providers in 2–3 min at the bedside, allowing for easy adaptability into the daily care routine. The CAM-ICU tool evaluates four primary features of delirium: acute fluctuations in mental status, inattention, disorganized thinking, and altered levels of consciousness. Multiple validation studies have demonstrated >80% sensitivity and >95% specificity in critically ill patients. 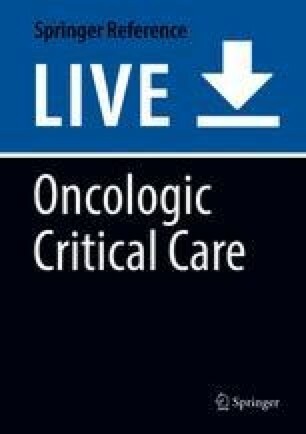 In a cohort of noncritically ill oncology patients, the CAM-ICU showed a lower sensitivity: specificity, however, remained >95%; thus in lower severity of illness patients, a brief assessment tool may miss some delirium, and a more detailed exam may be warranted. Importantly, assessments for delirium using the CAM-ICU have a very high positive predictive value across multiple patient populations and hospital settings. First introduced by Bergeron et al. in 2001, the ICDSC scores patients on eight features of delirium adapted from the DSM criteria: altered level of consciousness, inattention, disorientation, hallucination or delusion, psychomotor agitation or retardation, inappropriate mood or speech, sleep/wake cycle disturbance, and symptom fluctuation. Scores are collected over the course of a nursing shift without directly engaging patient participation. In validation studies, both sensitivity and specificity tend to be lower than with the CAM-ICU. Another scale designed to reflect diagnostic criteria of the DSM-IV, the MDAS (Table 3), was first introduced by Breitbart et al. to assess the presence and severity of delirium in medically ill patients. Clinicians grade patients on a four-point scale for ten items: awareness, disorientation, short-term memory impairment, impaired digit span, inattention, disorganized thinking, perceptual disturbance, delusions, change in psychomotor activity, and sleep-wake cycle disturbances. Initial assessment in a small group of inpatient cancer and acquired immunodeficiency syndrome (AIDS) patients showed a sensitivity of 71% and specificity of 94%. The MDAS has subsequently been validated in the advanced cancer and critical illness populations. With growing interest in assessing severity of delirium and not only a positive/negative assessment value, the CAM-ICU was adapted to include a numbered scale (0–2) for each delirium feature. This severity scale, the CAM-ICU-7, has been validated in critically ill patients, and severe delirium scores have been found to correlate with an increase in mortality. Implementation of a validated delirium assessment tool promotes consistency and early identification of acute brain dysfunction. Current guidelines from the Society of Critical Care Medicine recommend utilizing the CAM-ICU or ICDSC for their strong psychometric properties and distinct design for use in critically ill patients who may require mechanical ventilation . 1. Will a stone float on water? 2. Are there fish in the sea? 3. Does 1 pound weight more than 2 pounds? 4. Can you use a hammer to pound a nail? 1. Are you having unclear thinking? The reported prevalence of delirium is highly variable with age, severity of illness, and assessment method. Delirium is estimated to occur in 19–30% of inpatient hospitalizations with a higher prevalence in the elderly population. In surgical patients, 45% will develop postoperative delirium in the acute recovery period, and of those admitted to the hospital postoperatively, rates range from 32% up to greater than 50% in high-risk surgical patients. The highest rates of delirium have been found in the critically ill population where prevalence is generally reported at 30–50% overall. In patients requiring mechanical ventilation, however, up to 80% will experience delirium. Delirium is also a common phenomenon in patients with cancer. In older cancer patients admitted to the hospital for symptom management, 50–60% meet criteria of delirium at admission or will develop delirium over the course of their hospital stay. Additionally, symptoms may persist for weeks after discharge. Similarly, 50% of patients in the palliative care setting have been found to meet criteria for delirium diagnosis. As the severity of illness progresses, delirium frequently accompanies, and up to 85% of terminally ill patients will demonstrate delirium in the final week of life. Multiple risk factors are associated with developing delirium. Risk factors can be stratified into two broad categories: predisposing and precipitating factors. Predisposing risk factors are those that the patient presents with versus precipitating factors, which are related to the course of critical illness and iatrogenic influences. While predisposing risk factors are important to understand, they are difficult to alter. However, precipitating factors provide targets for intervention for prevention of delirium. A summary of risk factors is provided in Table 4. One of the most commonly cited predisposing risk factors for delirium is preexisting cognitive impairment and dementia. While it is intuitive that baseline cognitive dysfunction increases vulnerability to acute cerebral dysfunction in critical illness, studies have demonstrated that patients found to have baseline compromise in the microstructural integrity of white matter in the cerebellum, hippocampus, and thalamus were at increased risk of developing postoperative delirium, independent of clinical cognitive dysfunction. Increasing age has also been associated with increased risk of delirium development across a range of populations, including critical illness, oncology, and surgical patients. Patients with higher comorbid disease burdens develop delirium at higher rates, especially hypertension and respiratory disease. Observation that patients with more cognitive and physical disease burden are more likely to develop delirium has increased interest in the relationship between frailty and delirium. Initial studies have focused on the surgical population and have demonstrated an increased risk of postoperative delirium in frail patients. In the palliative care setting, a lower score on the Palliative Performance Scale, indicative of worse physical function, has been associated with an increased risk of delirium during admission to a palliative care unit. Mental health also appears to play a role as baseline depression is associated with delirium development. This is particularly important in cancer patients where prevalence of depression is estimated to be 15–25%, more than twice the rate observed in the general population. A unique consideration in oncology patients is the presence of primary brain tumors or development of metastases to the brain or leptomeninges which may also contribute to acute cerebral dysfunction by reducing the brain’s resiliency against insults such as acute illness. In addition, a number of chemotherapy agents are associated with neurologic toxicity and delirium including immunomodulators, vinca alkaloids, and platinums. Identifying and understanding precipitating risk factors for delirium allow the care team an opportunity to apply increased attention, resources, and prevention strategies. Lawlor et al. reported the presence of three or more precipitating factors per episode of delirium in oncology ward patients, which increased to more than ten risk factors per patient in the ICU in work by Ely and colleagues . Worsening severity of illness and acute physiologic derangement as demonstrated by SOFA or APACHE II score has repeatedly been associated with delirium. Supporting this observation, the need for mechanical ventilation is also associated with an increased prevalence of delirium in the ICU and in critically ill cancer patients. Hypoxia, whether related to infection or tumor burden, has been associated with delirium, and progression to hypoxic encephalopathy has been associated with nonreversible delirium. Critically ill patients commonly present with or develop metabolic derangements that may provide a reversible target for intervention. Abnormalities associated with delirium include metabolic acidosis, elevated creatinine, sodium imbalance, and hepatic failure. Cancer and the therapies used for treatment frequently alter hematologic status. Evidence regarding anemia in delirium has been inconclusive, and lymphopenia has not been associated with delirium in critical illness. Two precipitating factors fall most directly under control of the critical care team: (1) pain management and (2) medication selection with special attention to sedating and analgesic medications. Uncontrolled pain, particularly in the elderly population, may manifest as delirium and further preclude patients’ ability to communicate their pain experience. In the surgical population, moderate to severe pain increases the risk of developing postoperative delirium. This has also been documented in case reports where severe pain from cancer caused agitated delirium that receded once the pain was managed. The sedating effects of traditional pain medications, predominantly opioids, present a challenge to providers in adequately managing pain without causing oversedation. Evidence regarding the relationship between opioids and delirium is currently inconclusive in the critically ill population. Opioid administration has been independently associated with delirium in some ICU populations. However, others have found no difference in delirium development in patients receiving opioids or that opioids reduced the incidence of delirium. The choice of opioid administered has been shown to impact outcomes. Patients given meperidine are more likely to develop delirium compared to other opioids. Morphine has also been associated with delirium in the critically ill population, and patients receiving morphine via patient-controlled analgesia (PCA) were more likely to develop delirium after surgery when compared to fentanyl PCA . These effects may be related to the prolonged duration of action of these drugs, as well as active metabolite accumulation in the setting of renal or hepatic compromise. Evidence in the oncology population overwhelmingly identifies opioids as a modifiable risk factor for delirium development. In a cohort of severely medically ill cancer patients, 90% of those that developed delirium were on opioid therapy , and opioid administration appears to increase risk of delirium in a dose-dependent fashion . Therefore, while pain management is a pillar of cancer therapy and symptom management, providers should exhibit caution in opioid choice and dose, seeking alternative means of pain control to minimize risk of delirium. Medication choice and dose are also important factors in providing sedation in the critical care setting. Benzodiazepines have been a common choice for sedation and anxiolysis but are now known to be strongly associated with delirium development in critical illness; these effects do not appear to be medication specific but rather an association with the entire class of benzodiazepines. Risk of developing delirium also increases with deeper levels of sedation. Medications given for therapeutic intervention or symptom management in oncology patients may also increase risk of delirium. Many chemotherapy drugs have been associated with neurotoxicity and an increased risk of delirium. Steroids are often a component of therapy regimens and have been associated with an increased risk of delirium in advanced cancer and palliative care settings and promote transition to delirium in the ICU. Finally, many medications used for cancer symptom management, including promethazine, diphenhydramine, and cyclobenzaprine, have anticholinergic properties and may precipitate delirium development. Importantly, several medications associated with delirium are often started in the ICU and inappropriately continued upon transition out of the ICU or after discharge. As such, clinicians caring for the oncologic critically ill patient need to be vigilant about reducing medication exposure when appropriate. The pathophysiology of delirium involves complex, multifactorial interactions that have not been clearly defined. 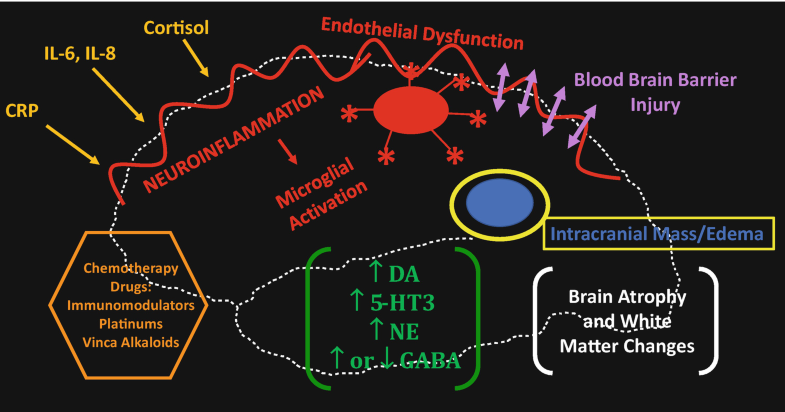 The current prevailing hypotheses include neuroinflammation, endothelial dysfunction, changes in cerebral perfusion patterns, increased blood-brain barrier permeability, cholinergic deficiency, abnormal neurotransmitter activity, and structural changes to the brain including neuronal aging and cerebral atrophy (Fig. 1). It is well accepted that cancer induces a chronic state of inflammation, which is an established mediator of critical illness and acute brain dysfunction. Elevated baseline C-reactive protein (CRP) levels have been associated with delirium in medical and surgical populations. In a cohort of patients awaiting noncardiac surgery, elevated CRP concentrations preoperatively and 2 days after surgical stress were associated with longer duration of delirium and increased severity of symptoms . Plasma cytokines and inflammatory mediators including IL-6, IL-8, and cortisol have also been associated with delirium development. Systemic inflammatory mediators communicate directly with the brain via peripheral primary afferent nerve activation. In addition, proinflammatory cytokines bind to the endothelium that comprises the blood-brain barrier (BBB), initiating an inflammatory signaling cascade, altering adhesion molecules, and promoting active cytokine transport across the BBB. Changes induced in the endothelium may lead to cell death and detachment, coagulation activation with microvascular thrombosis, and altered vascular permeability which subsequently result in ischemia and neuronal apoptosis. Hughes et al. found that elevated levels of biomarkers associated with endothelial dysfunction and BBB injury (S100B, E-selectin, plasminogen activator-1) were associated with increased duration of delirium during critical illness . A key mediator of inflammation in the brain are microglia, normally quiescent macrophages that are activated by inflammatory mediators to produce proinflammatory cytokines and reactive oxygen species that weaken astrocytic tight junctions and affect neuronal transmission. Once activated, microglia proliferate and further propagate the inflammatory insult by recruiting monocytes to the brain, resulting in neuronal apoptosis and brain edema. These acute insults likely lead to structural changes and subsequent long-term impairments in brain function. Early observations that patients frequently developed delirium after exposure to toxins and drugs known to impair cholinergic function led to an interest in the role of neurotransmitters in delirium development and the cholinergic deficiency hypothesis of delirium. Further investigation supporting this theory found increased serum anticholinergic activity was associated with delirium and that delirious patients had decreased levels of acetylcholine in cerebrospinal fluid (CSF) and plasma . Proposed mechanisms of decreased cholinergic function include impaired synthesis pathways, decreased availability of precursor molecules such as Acetyl-CoA, and altered interaction at neural synapses in the presence of anesthetic drugs or anticholinergic medications. In addition, acetylcholine is depleted in high stress and inflammatory states, and further regeneration is impaired as synthesis is downregulated. Depletion of acetylcholine may contribute to an overall state of inflammation, as vagal stimulation and acetylcholine release have been found to attenuate the systemic inflammatory response and inhibit production of proinflammatory cytokines. Specific to the inflammatory response in the brain, microglia have acetylcholine receptors that, when activated, inhibit microglia activity. Loss of regulation of microglia activity promotes neuronal inflammation and further contributes to the development of delirium. Acetylcholine is one component of a balanced network, and disruptions in normal levels and activity of other neurotransmitters, including dopamine, norepinephrine, and serotonin, have been associated with delirium. Excess dopamine levels have been associated with symptoms of psychosis and hyperactive delirium features. This is further supported in observations of drugs that interact with dopamine receptors. Dopamine agonists are known to potentially induce psychosis, and dopamine antagonists are used to treat psychotic episodes (and increasingly used to treat delirium). In a large observational study of critically ill patients, those receiving dopamine infusion for hemodynamic support were found to have higher odds of developing delirium . Norepinephrine, normally involved in alertness and arousal pathways, has been found to be elevated in patients with delirium and associated with agitation, anxiety, impaired attention, psychosis, and hyperactive delirium . The role of serotonin in delirium is less well characterized. Serotonin interacts with cholinergic pathways, and elevated levels, in the setting of deficient acetylcholine, have been associated with impairment in learning and memory in animal models. In critically ill patients, Pandharipande et al. found elevated plasma levels of the serotonin precursor tryptophan were associated with delirium. Gamma-aminobutyric acid (GABA) serves as the primary mediator of inhibitory pathways in the brain, and imbalance in GABA homeostasis has been associated with delirium. Administration of GABA agonists has been associated with increased risk of transition to delirium. Conversely, patients with postoperative delirium were found to have lower levels of GABA. Further, IL-6, which has been independently associated with delirium, appears to mediate central destruction of GABA neurons. Neurotransmitter pathway interactions are highly complex and overlapping, and likely each plays a role in the pathophysiology of delirium. Much ongoing work is dedicated to clarifying these pathways and selecting targeted interventions to restore balance in states of cerebral dysfunction. Neuroimaging studies have identified cerebral atrophy and disruption of white matter integrity as common features of patients with delirium. In addition, structural changes have been found to correlate with delirium severity and long-term cognitive outcomes. ICU patients who experienced delirium have an increased ventricle-to-brain ratio indicative of brain atrophy on imaging obtained at discharge and at 3-month follow-up. Atrophy of the superior frontal lobes and hippocampus was associated with longer duration of delirium, and brain atrophy at 3-month follow-up was associated with cognitive impairment up to 12 months after discharge . White matter changes in the corpus callosum and anterior limb of the internal capsule have been observed in patients with prolonged duration of delirium. Failure of these changes to resolve within 3 months of discharge was associated with cognitive decline up to 12 months after discharge . In elderly patients undergoing elective major noncardiac surgery, a postoperative decrease in integrity and increase in diffusion in periventricular, frontal, and temporal white matter, when compared to preoperative magnetic resonance imaging, were associated with postoperative delirium . Cancer occurs at a disproportionately higher rate in the elderly population, who are also at a higher risk for developing delirium. The aging population often demonstrates a declining physiologic reserve when compared to a younger cohort. Exposure to systemic stressors, such as cancer and critical illness, increases their susceptibility to acute brain dysfunction. Many factors are proposed to contribute to this vulnerable state. Aging is associated with a decline in brain volume and the integrity of white matter. Neuronal tissue loss has also been observed to occur over time. Another well-defined phenomenon is a decrease in cerebral blood flow with increasing age. This has been demonstrated both in comparing older populations to a younger cohort and imaging the same cohort of individuals over time. Decreased blood flow provides less oxygen and may slow metabolism, altering activity and availability of neurotransmitters. One neurotransmitter demonstrated to change over time is acetylcholine with elderly populations expressing lower levels of acetylcholine. Many changes of normal aging mirror pathologic changes associated with delirium and highlight a possible mechanism of the increased prevalence of delirium in the elderly population. Pain is a common experience for patients with cancer and for those in the ICU. One meta-analysis estimated the prevalence of pain to be 59% for patients under ongoing anticancer treatment and 64% in those with metastatic or terminal disease, with 33% experiencing ongoing pain even after curative treatment . In critical illness, up to 50% of patients report pain at rest or during a procedure. The first step in effective pain management is performing a pain assessment. Several pain assessment scales are available. Visual Analogue Scales (VAS), Verbal Rating Scales (VRS), and Numerical Rating Scales (NRS) have all been validated and found to be equivalent assessments in clinical oncology research and in palliative care. A visually enlarged version of the Numerical Rating Scale (NRS-V) demonstrated comparable validity and responsiveness to other scales in critically ill patients, but a superior negative predictive value, thus making it the scale of choice in the ICU. This scale is not always feasible in the setting of sedation and mechanical ventilation, leading to an increased risk of underassessment. The Critical-Care Pain Observation Tool (CPOT) and the Behavioral Pain Scale (BPS) meet this need by allowing providers to assess pain in intubated and nonverbal patients. Guidelines recommend the use of either CPOT or BPS due to their high inter-rater reliability and validity . Opioids are generally the first-line therapy for pain in the ICU. Given their potential association with delirium development, it is important for critical care providers to consider a multimodal strategy including non-opioid medications and alternative interventions such as heat or ice, cutaneous stimulation (massage), and cognitive behavioral interventions (i.e., relaxation techniques). Cancer pain therapy is guided by the World Health Organization ladder that begins with non-opioids and escalates to short- and long-acting opioid medications and adjuncts, and patients may present with ongoing pain regimens at home. It is important to continue home regimens of scheduled chronic pain medications with as needed doses for breakthrough pain to prevent a pain crisis. In the setting of critical illness, home doses may need to be adjusted for renal or hepatic compromise to prevent overdose effects from prolonged activity or metabolite buildup. Opioid requirements may be decreased by adding adjuncts like acetaminophen and nonsteroidal anti-inflammatories (NSAIDs). If pain is neuropathic in nature, opioids have limited effect, whereas gabapentanoids and tricyclic antidepressants provide superior analgesia. Ongoing assessment of pain and evaluation of medication regimens will optimize patient care and address a significant risk factor for delirium. Sedation is nearly universal in patients requiring mechanical ventilation in the ICU. Two components of sedation have been shown to directly influence delirium development: choice of sedative and depth of sedation. A wide variety of sedation medications have been studied including benzodiazepines, dexmedetomidine, propofol, and morphine. Benzodiazepines were the first-line choice of sedative for many years; however, growing evidence indicates this regimen likely promotes delirium development. Dexmedetomidine has emerged as an alternative sedative with superior outcomes. When compared to continuous infusions of lorazepam or midazolam, patients receiving dexmedetomidine were less likely to develop delirium or coma and had more days alive and free of delirium or coma [42, 44]. Given the evidence supporting increased risk of delirium, current critical care guidelines recommend avoiding benzodiazepines for sedation. Propofol has become a common choice for ICU sedation due to its rapid onset (1–2 min) and short duration of action (2–8 min). In cardiac surgery patients, comparison of dexmedetomidine to propofol has shown reduced risk of delirium development and decreased duration of delirium  with dexmedetomidine. Large randomized controlled trials with robust delirium outcomes are needed to compare acute and long-term brain dysfunction between these two commonly used agents for ICU sedation. Another alternative strategy is analgesic-based sedation; current studies of this strategy, however, have not extensively evaluated delirium. In one trial of cardiac surgery patients, dexmedetomidine was associated with a decreased duration of delirium when compared to a morphine-based regimen . Equally important as choice of sedative, monitoring and minimizing depth of sedation are associated with improved delirium outcomes. Contrary to the paradigm of deep sedation for all mechanically ventilated patients, Kress et al. found that daily interruptions of sedative infusions decreased duration of mechanical ventilation and ICU stay. Girard et al. then found that coordinated spontaneous awakening and breathing trials were associated with fewer days of coma, indicating an improvement in brain dysfunction. In addition to the spontaneous awakening and breathing trials, reducing the amount or level of sedation given is protective to the brain. Protocols that target lower levels of sedation and de-escalation of sedatives are associated with decreased duration of delirium. In addition to early beliefs that mechanically ventilated patients required deep planes of sedation, ICU patients were conventionally thought to be unable to participate in mobility activities and physical therapy. Multiple studies have dispelled this notion, proving that early initiation of activity including passive and active range of motion, bed mobility, transferring, sitting, pre-gait exercise, and walking is safe and feasible in ICU patients and associated with improved outcomes. Early mobilization protocols engage participation from nursing, respiratory therapy, and physical and occupational therapy to provide daily activity sessions coordinated with periods of interrupted sedation. In randomized controlled trials across medical and surgical ICU populations, implementation of a coordinated mobility initiative has been associated with an increase in alertness and delirium-free days, reduced incidence of delirium, and decreased sedation requirements [45, 47]. It is well established that ICU patients do not sleep often and experience poor quality of sleep. When monitored with electrosomnography, patients were found to sleep as little as 2 h per 24-h period, though in some patients, no electrophysiologic identifiable sleep was detected . Sleep patterns are characterized by severe fragmentation with a high arousal index and frequent disruptions . Admission to the ICU is associated with disruption in normal circadian rhythm and sleep/wake cycles with up to 60% of sleep occurring during the day and only 40% overnight. Sleep deprivation causes similar symptomatology to delirium and is postulated to be a risk factor for delirium development. Despite the lack of direct causality between sleep deprivation and delirium, efforts to improve sleep hygiene have shown improved delirium outcomes. Three primary areas for intervention include minimizing nighttime exposure to light, sound, and awakening for care, medication, or assessment. Simple interventions including providing ear plugs and eye masks to patients overnight have been associated with reduced incidence of delirium and an increase in delirium-/coma-free days. Multidisciplinary sleep bundles that focus on reducing light and noise, minimizing patient care interactions overnight, and promoting patient orientation during daytime hours have shown similar results. Though minimizing light exposure overnight has been beneficial, dynamic light application therapy has not been shown to reduce delirium. Pharmacologic intervention with melatonin to improve sleep has gained interest based on observations that sedated and mechanically ventilated patients exhibit impaired or even abolished circadian rhythmic melatonin secretion and abnormally low levels of melatonin secretion have been detected in mechanically ventilated patients and postoperative critically ill patients who developed delirium. Trials of melatonin and melatonin agonists have produced mixed results with regard to delirium development. In a randomized controlled trial of elderly hospitalized internal medicine patients, melatonin administration was associated with a decreased risk of developing delirium . However, postoperative administration of melatonin after hip fracture repair did not alter rates of delirium , and a Cochrane review did not find any reduction in delirium with melatonin . Interestingly, Ramelteon, a melatonin agonist, has been associated with a lower risk of delirium in a mixed ICU and acute care population  and a tendency toward reduced delirium in patients after lung cancer surgery . As risk of delirium is multifactorial and ICU patients generally have multiple risk factors for delirium, implementation of evidence-based prevention bundles, which address multiple components of risk, has been highly effective. Bundled protocols were initially developed for medical ward patients and demonstrated efficacy in reducing delirium across medical and surgical inpatients. Included components targeted maintaining patient orientation through reminders of date and time, restoring vision and hearing aids, therapeutic activities with cognitive stimulation, and non-pharmacologic sleep hygiene. Early mobilization is also a key component, and early elimination of immobilizing equipment such as catheters and restraints is emphasized to facilitate in this goal. 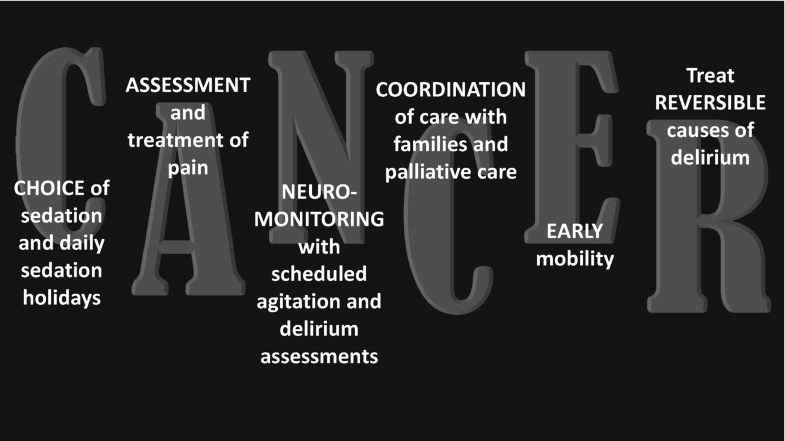 To meet the specific needs of ICU patients, a multicomponent intervention known as the Awakening and Breathing Coordination, Delirium monitoring/management, and Early exercise/mobility (“ABCDE”) bundle was developed and demonstrated a reduction in delirium incidence and duration. Given the overall success of bundles in improving patient care, the Society of Critical Care Medicine initiated the ICU Liberation Collaborative with an expanded bundle now known as the ABCDEF bundle: Assess, prevent, and manage pain; Both spontaneous awakening trials (SAT) and spontaneous breathing trials (SBT) should be performed daily; Choice of sedation; Delirium – assess, prevent, and manage; Early mobilization; and Family engagement and empowerment . In a large-scale implementation trial of seven community hospitals, as compliance with the ABCDEF bundle increased, significant increases in survival and days alive without delirium or coma were observed . To incorporate factors specific to oncology patients, we have adapted the ABCDEF bundle to the CANCER bundle: Choice of sedation with daily sedation holidays, Assess and treat pain, Neuromonitoring with scheduled RASS and CAM assessments, Coordination of care with families and palliative medicine, Early mobility, and treat Reversible causes common to cancer including electrolyte imbalance, dehydration, and triggering medications used to for symptom management (Fig. 2). Multiple theories on the pathophysiology of delirium have led to the study of corresponding drug interventions for delirium prophylaxis, including antipsychotics to suppress excess dopamine and neurotransmitter imbalance, acetylcholinesterase inhibitors to increase cholinergic activity, and medications with anti-inflammatory properties including statins and ketamine. Antipsychotics have been the most widely studied intervention and have produced conflicting results. In one study of critically ill patients evaluated to be at high risk for developing delirium, 1 mg of haloperidol administered intravenously every 8 h was beneficial in reducing delirium . However, when applied to the general ICU population, two randomized controlled trials, the HOPE-ICU  and REDUCE  trials, found no difference in delirium outcomes with scheduled haloperidol. In the REDUCE trial, the most recent and largest study to date of prophylactic haloperidol in ICU patients, no difference was found in delirium incidence, delirium-free days, length of stay, or survival overall or in pre-defined subgroups including type of ICU and severity of illness. Mixed results have also been observed in the surgical population. Atypical antipsychotics have demonstrated better results, though studies are primarily in surgical patients and may not extend to the general ICU population. In elderly patients undergoing joint replacement, perioperative administration of olanzapine significantly decreased the incidence of delirium. In cardiac surgery patients, risperidone given on arrival to the ICU has been associated with decreased postoperative delirium, and in post-cardiopulmonary bypass patients who develop subsyndromal delirium, initiation of scheduled risperidone was associated with decreased conversion to clinical delirium. This was further supported in a systematic review that found second-generation antipsychotics were more beneficial in preventing delirium when compared to placebo . Despite the association between anticholinergic states and delirium, attempts to increase central cholinergic supply with acetylcholinesterase inhibitors have not improved delirium outcomes. Gamberini et al. initiated scheduled rivastigmine to postoperative cardiac patients with no effect on delirium development. Donepezil, an acetylcholinesterase inhibitor widely used for dementia, has also been studied in varied surgical populations with no difference in the incidence of delirium development. Dexmedetomidine is a highly selective and potent alpha-2 agonist that is eight times more selective for the alpha-2 receptor than clonidine. It activates presynaptic alpha-2 receptors of sympathetic nerve endings, inhibiting the release of norepinephrine. Dexmedetomidine is thought to act at multiple points in the central nervous system (CNS) that are beneficial in preventing delirium. Central activity occurs at the locus ceruleus which modulates vigilance and nociceptive neurotransmission. In addition, direct action at the level of the spinal cord decreases transmission of pain signals. Importantly, the effects of dexmedetomidine on ventilation are minimal. Prophylactic dexmedetomidine for delirium prevention has been primarily studied in the surgical population. In one study of joint replacement surgery patients, a perioperative infusion of dexmedetomidine resulted in lower rates of delirium . However, in a larger study of elderly noncardiac surgery patients, there was no difference in development of postoperative patients receiving a perioperative dexmedetomidine infusion with continuation for up to 2 h postoperatively when compared to usual care . While results are mixed for patients receiving perioperative dexmedetomidine infusions, in a study of noncardiac patients admitted to the ICU postoperatively, dexmedetomidine infusion initiated at the time of admission and continued until 0800 the following morning was associated with a decreased incidence of delirium for up to 7 days, lower pain scores, and reduced duration of delirium . In addition, a case report of intractable pain and delirium in a palliative care oncology patient was resolved with a continuous subcutaneous infusion of dexmedetomidine . Prophylactic dexmedetomidine infusion has shown promise in critical care settings, though further studies are needed to confirm and characterize clinical utility. The effects of systemic inflammation and proposed neuroinflammatory mechanism of delirium have prompted investigations into medications with known anti-inflammatory effects. Statins are known to exhibit complex pleiotropic anti-inflammatory effects including immunomodulation and enhancement of endothelial function. Similar to other pharmacologic interventions, statin use in the surgical population has demonstrated mixed results. In the ICU, continuing home statin therapy has been associated with decreased rates of delirium, and discontinuation of a home statin has been associated with an increased risk of developing delirium. Initiation of statin therapy in critically patients on mechanical ventilation, however, has not been associated any change in delirium development in randomized controlled trials. Therefore, it appears that continuing a home statin may be beneficial, but initiating new therapy in statin-naive patients is not likely to improve outcomes. Another drug of interest for its anti-inflammatory and pain control properties is ketamine. Infusion of ketamine, an N-methyl-d-aspartate (NMDA) receptor antagonist, after cardiac surgery was associated with attenuation of delirium in one randomized controlled trial . However, in another trial of cardiac and noncardiac surgery patients, intraoperative administration of ketamine did not prevent postoperative delirium, and higher doses were associated with nightmares . Further, in a retrospective study of patients undergoing hip and knee arthroplasty, intra- and postoperative ketamine administration was associated with increased risk of delirium . Steroids are frequently a primary therapy in suppressing inflammatory states and have also been investigated for their ability to suppress inflammation and prevent delirium. In cardiac surgery, steroid administration has been trialed to reduce post-cardiopulmonary bypass inflammation and delirium; however no difference in postoperative delirium has been demonstrated in patients receiving perioperative steroids. Steroid use in the ICU has generated conflicting data regarding development of delirium. In a trial of mechanically ventilated patients in the ICU, steroid administration within the previous 24 h was associated with higher odds of developing delirium . Conversely, in a cohort of ICU patients with severe sepsis, patients who received a 5-day course of hydrocortisone were less likely to develop delirium than those receiving a placebo . Further work may characterize certain populations that would benefit from steroid administration. It is also important to remember that patients with metastatic or primary brain lesions may benefit from steroid administration for mass effect and edema. Delirium prevention should be the primary strategy for management as there are currently no FDA-approved pharmacologic treatments for delirium available, and evidence for pharmacologic options has demonstrated limited efficacy with myriad side effects. The first-line medication choice has traditionally been typical or atypical antipsychotics; large randomized controlled trials, however, are lacking, and current evidence regarding efficacy is conflicting. In a trial of critically ill patients randomized to haloperidol, ziprasidone, or placebo, there was no difference in delirium- or coma-free days between the groups . This is one of the few trials currently that includes a placebo arm for comparison. Many trials have examined a difference in efficacy between different antipsychotic medications with variations in side-effect profile but no clear preferred treatment. While most of these trials demonstrate improvement in delirium symptoms over time, it is unclear as to whether the improvement results from the passing of time and resolution of underlying etiologies or medications administered, as there is often no placebo group for comparison. In a small study of palliative care patients, administration of haloperidol, risperidone, olanzapine, or aripiprazole showed equally effective reduction in delirium as measured by the MDAS over time. Patients receiving haloperidol were more likely to experience extrapyramidal symptoms, and those receiving olanzapine were more sedated . Similarly, in an open trial of olanzapine for hospitalized cancer patients with delirium, symptoms resolved in 76% of patients, but 30% demonstrated sedation . In a comparison between haloperidol and olanzapine in critically ill patients, delirium improved and benzodiazepine administration declined in both groups; however the haloperidol group developed extrapyramidal symptoms . In a comparison of risperidone and olanzapine in hospitalized patients (most with a primary diagnosis of cancer), both groups showed improvement over the 7-day trial without a superior treatment , indicating that risperidone may be used as alternative to haloperidol or olanzapine with fewer side effects. Quetiapine offers another alternative antipsychotic therapy that has been associated with improved delirium rating scores in elderly hospitalized patients with delirium. In addition, adding scheduled quetiapine (50 mg every 12 h) to as needed haloperidol in critically ill patients was associated with shorter time to resolution of delirium, decreased agitation, and increased likelihood of transfer to home instead of a rehabilitation facility . A trial of multicomponent therapy targeted dopamine and acetylcholine pathways by adding rivastigmine, a centrally acting acetylcholinesterase inhibitor, to a haloperidol regimen. This study, however, was terminated due to increasing mortality trends and median duration of delirium in the rivastigmine group . Antipsychotics have performed less favorably in patients with advanced cancer and terminal delirium. In one large study of palliative care patients with advanced cancer and agitated delirium, addition of risperidone or haloperidol to supportive care was associated with worse delirium symptom scores, more extrapyramidal symptoms, and worse survival in the haloperidol group when compared to placebo . Another study of palliative care patients with advanced cancer, focused primarily on symptom management of agitated delirium, compared addition of lorazepam versus a placebo to haloperidol therapy and found less agitation as indicated by lower RASS scores in the group receiving haloperidol. This group also required fewer rescue neuroleptics, and caregivers and families perceived that patients receiving lorazepam were more comfortable . It is important to note that patients in the group that received lorazepam were often over sedated with higher MDAS and thus reflective of agitated delirium being converted to a hypoactive form of delirium. In contrast, patients in the placebo group were more likely to remain alert and calm. While caregivers perceived that patients were more comfortable secondary to a reduction in agitation, sedation and hypoactive delirium can still be distressing to patients and reduce precious time patients may have with their loved ones at the end of their lives. An alternative intervention that has shown promise in treating hyperactive delirium is dexmedetomidine. One trial randomized patients who were unable to be weaned from mechanical ventilation solely due to uncontrolled hyperactive delirium to a dexmedetomidine infusion versus placebo. Those receiving dexmedetomidine demonstrated more rapid resolution of delirium symptoms, shorter time to extubation, and an increase in ventilator-free hours . Dexmedetomidine has also been used as a rescue therapy in non-intubated critically ill patients with agitated delirium refractory to haloperidol. In a non-randomized trial, patients found to respond to haloperidol were initiated on a haloperidol infusion, whereas non-responders received a dexmedetomidine infusion. The dexmedetomidine group demonstrated less agitation with higher quality of sedation, less oversedation, and a shorter time to ICU discharge . While more randomized trials are needed, dexmedetomidine has shown promise as an intervention for delirium, particularly agitated delirium which is frequently seen in advanced cancer and distressing to patients and caregivers alike. An important consideration for delirium management in advanced cancer patients is evaluation of opioid therapy and evaluation for opioid-related cognitive dysfunction. While the etiology is not well understood, the escalating doses of opioid often prescribed as cancer progresses are associated with a phenomenon known as opioid-induced neurotoxicity (OIN) which may manifest as delirium that is refractory to conventional therapy. Strategies for addressing OIN include opioid rotation and initiation of alternative therapies such as methadone or ketamine with the goal of adequately controlling pain, a precipitating factor for delirium, and reducing the dose of opioid administered to reduce the side-effect profile. Opioid rotation may allow for a reduction in dose, as well as removal of an opioid associated with delirium development, as illustrated in an open-label trial where patients transitioned from fentanyl to morphine demonstrated improved pain scores and improved delirium as evaluated by the MDAS . Another choice for opioid rotation is methadone, a long-acting mu-opioid agonist that also acts at NMDA receptors, is quick in onset (about 30 min), and has a half-life around 24 h. Rotation to methadone has been associated with improvement in uncontrolled pain and delirium [6, 39]. Non-opioid alternatives have also been used to treat OIN. In a case report of OIN in a hospice patient, adding a ketamine infusion allowed for rapid reduction of opioid dose with improved pain control and resolution of OIN symptoms including delirium . Delirium is characterized by acute and rapid fluctuations in mental status and is a common diagnosis among the critically ill cancer population. The prevention of delirium in the critically ill involves multiple components including choice of pain and sedating medications, early physical and occupational therapy, improving sleep, and daily awakening and breathing trials. There are no FDA-approved pharmacologic prevention or treatment options available for delirium, though some of the antipsychotics and dexmedetomidine have shown promise in various studies. Delirium can be a challenging and deleterious diagnosis for critically ill cancer patients, but with proper recognition as well as validated preventative and management strategies, the negative consequences associated with delirium can be decreased.